Popular faith schools are becoming a way of preserving privilege as parents are asked to go to extreme lengths to prove their faith, a report argues. The Runnymede Trust social equality charity report suggests top schools with pupils from a single religion are becoming increasingly exclusive. It also suggests parents are choosing faith schools because of their academic reputation, not their religious ethos. The government said it had tightened the rules over fair admissions. The researchers held day-long focus group meetings involving 1,000 parents with children at faith schools, teachers, community leaders and faith school providers. They also conducted 30 in-depth interviews with those running faith schools for the report Right to Divide. They found that those which remained focused on the admission of children of only one faith tended to become more exclusive, especially if they were high achieving. As a result they faced more challenges in their admissions policies which included "rigorous authentication of religious affiliation". The report said: "Parents are required to prove their and their children's commitment to a particular faith in order to gain entry to a faith school. "This can lead to a high level of administration, including registers of attendance being taken in parish churches, references being sought and some very fine judgements being taken regarding the level of commitment from parents." Report author Dr Rob Berkeley said he was not sure schools were in a position to judge anyone's level of commitment to their faith. "We were collecting reports of people who were attending church regularly, but because they were not getting up and doing a reading, arranging the flowers or running a Sunday school class, they weren't being religious enough to get their child into a school." And some very over-subscribed faith schools have set up complicated points systems in order to judge the level of parents' religiosity. The report also suggested that many parents up and down the country had been choosing faith schools because they saw them as high-achieving, not because they wanted a faith-based education. A school's faith status was seen as a "proxy for potential achievement" in Blackburn, Liverpool and Leicester as well as in London, the report said. It added that the school adjudicator's report on the implementation of the schools admissions code found that faith schools were "disproportionately more likely to have used practices deemed unfair". These included asking parents about their ability to contribute funds, interviewing parents and keeping places unfilled rather than giving them to a pupil of a different faith. 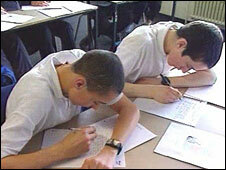 The report claims the intake of secondary faith schools is wealthier and higher achieving on entry than the average. It added: "This would suggest that the role of faith schools in challenging inequality is becoming obscured by other concerns. "If faith schools become a means of preserving privilege rather than challenging injustice, then this undermines their espoused vision of 'lived faith'." However, faith schools have often claimed they take a higher number of very poor pupils than the national average. The report called for an end to selection on the basis of faith. A Department for Children, Schools and Families spokesman said its new admissions code outlawed selection and unfair admissions practices which could increase social segregation. "It is crystal clear that pupils must not be discriminated against on the basis of their ethnicity, faith or social class. All schools must comply with the code. "Ministers are clear that all schools, faith or not, must play a big role in the wider community." He added: "Faith schools are a long-established part of the state school system in England. "Parents should be able to choose the type of education and ethos they want for their children. The bottom line is that faith schools are successful, thriving, popular and here to stay."